I'm not sure how I missed this and thought it was a joke until I saw a couple postings about it. Must. Get. To. Grocery. Store. ASAP. (though I admit that I actually prefer cereals like Grape-Nuts). 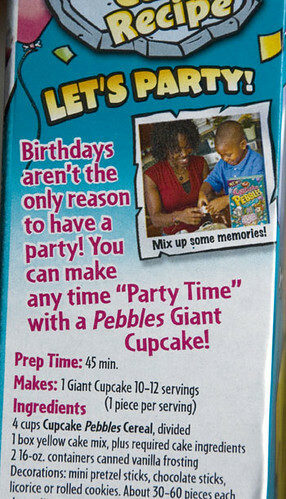 So it's true, now there is a cupcake cereal (not to be confused with cereal cupcakes) in the form of...Cupcake Pebbles!! f you haven’t been lucky enough to surf the next wave of deeply inappropriate first meals, I’m going to try and give you an idea of what to expect — but oh my God, you guys, I wish the Web was scratch ‘n’ sniff, because words can’t describe the overpowering blast of cupcakeness that uncoils itself, panther-like, and lodges in your nostrils when you open a box of Cupcake Pebbles. It almost literally punches you in the face. If Betty Crocker and Mike Tyson decided to open a bakery together, I think they would aspire to the visceral scent-clubbing this cereal delivers — it’s so thick, by the time you tear open the bag, you feel like you’ve already eaten several bowls. 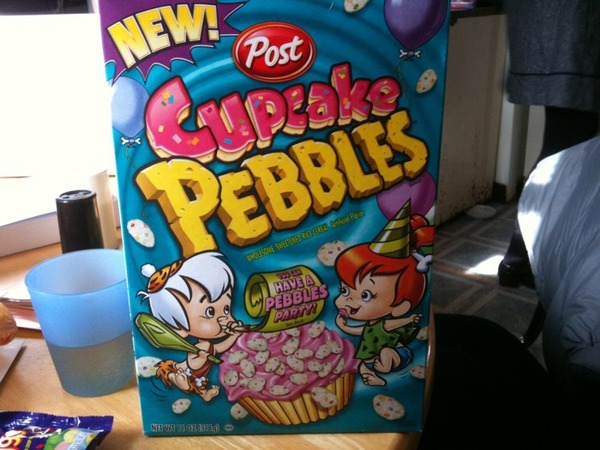 Once I got up from roflmao, I poured myself a bowl of Cupcake Pebbles. They emitted a wofty cake smell, the kind of smell hanging in the air in a bakery while they're waiting to put on the icing. The other types of Pebbles are fruity and cocoa, which are colored, so it's kind of funny seeing a bunch of naked little pebbles in the bowl. Naked as they are, they do have cereal's answer to confetti all over them, which makes them look festive and fun. So I poured the milk in and went to town. The main taste is a vanilla/batter-y kinda flavor, and it's surprisingly strong, though obviously not as intense as Fruity Pebbles. Taking a bite of Cupcake Pebbles is like eating your birthday in a bowl with Bamm-Bamm. I ate the bowl pretty quickly, but the pebbles seemed to take their time getting soggy. The flavor is relatively unique in the cereal world, and I enjoyed it a lot. I'm sure it's terrible for you, but hey. Go eat some celery, hippie. But seriously, the best part of it is that there's now a new flavor of milk to drink once the cereal is gone! That and the fact that Cupcake Pebbles don't leave a weird film on the top of your mouth like Fruity Pebbles do. What do you say, cupcake lovers? Would you try this? Should cupcakes by everywhere? I have to get some of those next time I hit the grocery store. They look absolutely dee-lish! I am definitely putting this on my list to look for when I go to the store! I bet it'd go good on some vanilla ice cream! HAHA these are so cute! I have to find this, the description of the smell is what did it for me! I saw this at Publix yesterday in passing...I'm gonna have to get some tomorrow! Anyway, it is quite disgusting the things they make intended for a child's breakfast, however, these kinds of cereals make for great before bed snacking instead of ice cream. As a cupcake lover, I'm sure it doesn't compare. As a junk food cereal lover, I would totally try it. Very cute. I bought this cereal after I saw it a few weeks ago and haven't seen it since in any supermarket since. My kids LOVE this! I'd better hunt some down again! When I saw these on the shelf (on sale at my local grocery for $1.89) I HAD to stock up! My kids were so so so excited, as I was also! They sure are tasty!! Everyone seems to like them, but I'm a little hesitant. But then again, I'm a boring Cheerios person. I want some SO badly! I am in Manhattan and haven't been able to find them ANYWHERE!! Lol, it's We Rate Stuff. But thanks for the link anyways. OMFG i need this large quantities I cant wait. I am going to the store right now.